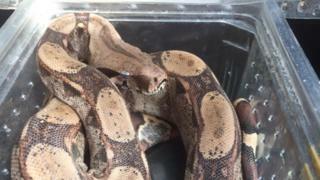 Two snakes were dumped in a town centre park after a failed bid to rehome them. The two baby boa constrictors were handed in on Tuesday after they were found in Ipswich’s Christchurch Park, Suffolk Police said. Pet shop Viking Aquatics said a young couple had gone into the shop earlier in the day and asked if they could take the snakes in. The reptiles were found less than two hours later. Police said the snakes had been rehomed to an experienced herpetologist. Viking Aquatics manager Rickie Clarke said they did not have any space for the snakes so they turned down the couple’s request to take them. He said he gave them a bit of advice about how to rehome them and they seemed to be “happy with that”. He added he was then surprised when the police came into the store with the snakes, still in the same tub the couple had carried them in. He described baby boa constrictors, which were about 12in (30cm) to 15in (38cm) in length, as “harmless”. Mr Clarke said they would “not have lasted long out in the park” as they may have become dehydrated in the tub and or fallen victim to predators such as birds and cats.